Izzy has so many hair bows and headbands. I’m asked often how we keep them organized. 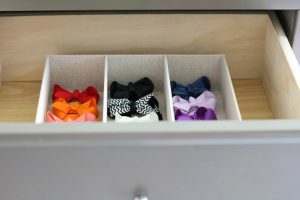 I’m going to share a few ways I keep Izzy’s bows and headbands organized for easy access when getting her ready in the morning. 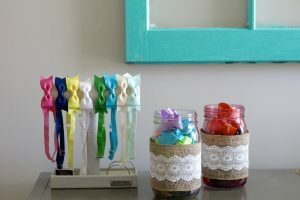 I like unique and fun ways to show off and organize Izzy’s accesories. 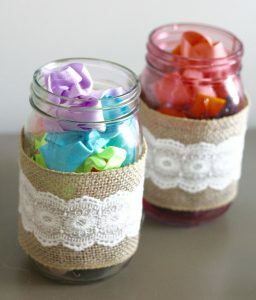 For bow clips I keep those in mason jars that I hot glued burlap and lace to. It’s easy to dump them out, grab the one I need and put them back in. Izzy’s headbands I love to hang on a necklace holder. This allows me to easily see which headband matches her outfit without moving them around. 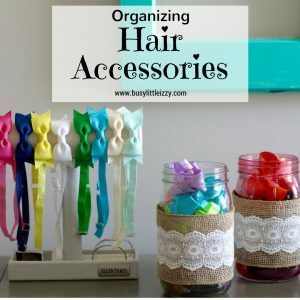 Another fun way to organize headbands or clips is with a jewelry organizer. You can find these for a good price at a TJMaxx. Place it into a dresser drawer to organize the accessories you need, so you can easily find what matches for the day. Now you are wondering, does Izzy have every color bow/headband? Yeah…..pretty much. Ha! If you follow us on Instagram you know she always has a matching bow for every outfit. Where are all of these headbands from? These adorable and colorful headbands are from Zelda Matilda. I love them so much because they will grow with her. 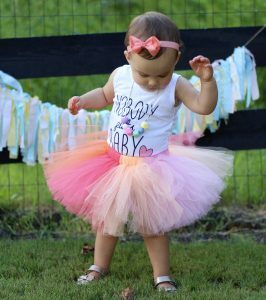 They have headbands that come with adjustable straps and headbands that come with removable clips. This means you can put those clips in your child’s hair as they get older. You can also mix and match headbands and clips. Zelda Matilda has many more goodies. If you are interested in checking out more of their headbands click here. Oh boy this little nugget is turing 1 1/2! 18 months old already, really? So cute! 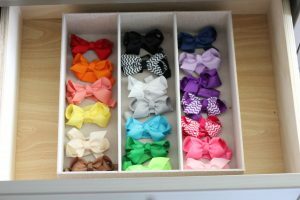 Every girl requires a different hair bow for every outfit!! We once were organized but I don’t know what happened. I love how you organized yours! Hahaha I have my moments where things get messy and then I do a full organize because it drives me bonkers. If it’s messy it because of Izzy …. Hehe ? Great tips!. Hair accessories do take the lion’s share of the clutter in a room.